1,This 4-ZONE RGBW LED controller kit is a perfect solution for multi-zone lighting system control for its up-to-date function Setup. If you are looking to controller multiple zones with a single hand-held remote, you already find the correct product! While this controller is designed for low voltage RGB+White LED lighting products, it can also work with low voltage RGB(four channels) LED lighting products (strip light/ light bulbs). 2, Synchronization function enables you the flexibility to combine your lights in different groups or zones and make each group change lighting mode simultaneously but also independently from other groups. 4 Certifications : CE, ROHS. 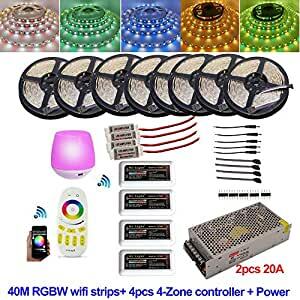 12 Light Color: RGB RGBW(RGB+Cold White). you can control your lights with iOS 6.0 or Android smart phone App, free download from Apple App Store, or Android Google Play with the new App name: Mi Â·light, automatically setting and you are ready to go!